Ambitious plans have been lodged with planners for a major multi-million pound centre which will put Aberdeen at the vanguard of teaching medical students and training health professionals. Through its location and the provision of essential state-of-the-art facilities, the new Matthew Hay building will facilitate two important developments in medical education and training: the full integration of teaching of anatomy with the development of clinical skills and knowledge of disease by medical students, and the enhancement of inter-professional teaching and learning. The latter reflects the crucial role of team working in the delivery of healthcare. Currently the University’s Department of Anatomy is based at Marischal College, in the centre of Aberdeen, where it is remote from the main campus at Foresterhill. This has prevented new students from integrating into the medical student community until well into their second year. The location has also precluded anatomy from being integrated into clinical skills training for practitioners at all stages of their careers. Also, the teaching of essential clinical skills – such as resuscitation, examination and communication skills – presently takes place at a pre-fabricated building which has reached the end of its lifespan. The outdated design of the Westburn Centre, which is based at Foresterhill, also hinders the modern teaching of clinical skills. The Matthew Hay project will reverse all of that and place Aberdeen at the forefront of medical teaching and learning. More key national and international conferences could be lured to Aberdeen as the building also features a 220-seater lecture theatre. The centre will also feature first-class conference facilities on its top floor which could open onto a planted rooftop terrace with spectacular views across the city. The University and NHS Grampian have committed £12 million towards the project. The project will seek to fundraise at least a further £4.5 million to ensure the centre is a truly outstanding facility. 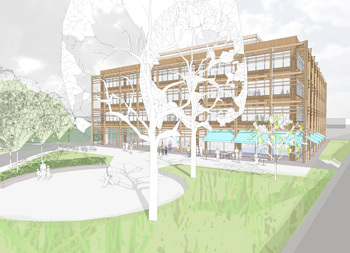 Award-winning architects Bennetts Associates have designed the four-storey building which could be clad in larch, cedar or oak, hopefully sourced from Scotland. The architects have strived to make plans as environmentally friendly as possible, making the most of natural light, and designing its structure so that the building’s heating and cooling can be controlled in more sustainable way. Professor Mike Greaves, Head of the University’s School of Medicine, said; “Knowledge of human anatomy is essential in a range of scientific areas and is fundamental to medical practice. The new facility will allow a higher profile to be given to anatomy teaching, delivered in state-of-the-art facilities. Dr Rona Patey, Director, Clinical Skills Centre at Foresterhill, said: “We are very excited that this development will provide an outstanding resource and inspiration for the education and training of NHS staff both now and in the future. Angus Donaldson, the University’s Director of Estates, added: “This is another positive development by the University and is part of a £228 million redevelopment of our campus which will take place over the next 10 years. The Matthew Hay project plans have just been lodged with Aberdeen City Council. If all goes to plan, construction is expected to take approximately 15 months with September 2008 the current target for completion. Professor Matthew Hay (1855-1932) was the original pioneer of the Foresterhill complex, which is the largest healthcare campus in Europe. In the 1920s he convinced city fathers of the importance of locationing treatment, prevention of disease and education together on one site – hence the co-location of the University and NHS Grampian. Professor Hay was appointed to the Chair of Forensic Medicine at Aberdeen at the age of 27. He lectured on public health and practical hygiene. In 1888 his career shifted from science and academic to society and administration when he became the Chief Medical Officer of Health for Aberdeen. At that time infectious diseases were rife and often epidemic. He turned the City Hospital into one of the finest infectious disease hospitals in the UK. It is said that he tramped the environs of Aberdeen on Sundays looking for suitable places for his scheme. In 1900 he found the barren slopes of Foresterhill. Dr Christine Kay from the University is available for interview - please contact Angela Ferguson to arrange on 01224 272960. Dr Rona Patey is also available – please contact Edith MacDonald, Senior Corporate Communications Officer, NHS Grampian 01224 554094. Visuals are also available of the development - please contact Angela Ferguson 01224 272960.